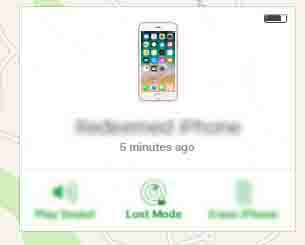 Find My iPhone is an app that assists with locating a missing iOS device from another iOS device or computer. If you no longer have access to an iOS device, refer to Apple's Find My iPhone Activation Lock article for info on how to manage them via a website. For assistance with enabling Find My iPhone, refer to Turn Find My iPhone On/Off. During the initial setup and activation of an iPhone, the Find My iPhone app may have been pre-installed. If the app was not pre-installed, refer to Download/Install Find My iPhone app for assistance. An Apple ID must be created to use Find My iPhone. For assistance with creating an Apple ID, refer to Create Apple ID. If a missing online iOS device is nearby, play a sound on it to assist with finding it. Navigate to the Find My iPhone section of icloud.com. A sound plays on the missing iOS device. Securely lock an online iOS device and display a custom message along with a contact number. The finder of the device is able to call the contact number from the device itself. If an iOS device is no longer being used, it can be removed from the Find My iPhone devices list. The iOS device is removed from the Find My iPhone device list.